Southdowns are pleased to supply Elecsol Leisure Batteries. Elecsol's 12v batteries can be used successfully in the following list of applications:- Motorhomes, Caravans, Marine (Narrowboats, Cruisers & Yachts), Cars, Electric vehicles, Electric scooters, Commercial vehicles, Tail-lifts, Renewable energy systems, Solar, Standby power. Elecsol batteries offer higher power and performance - through the use of unique patented carbon fibre technology. Independent tests prove they give 20% more power output for no increase in the overall weight of the battery. Carbon Fibres strengthen the grid ensuring no plate buckling when used for engine starting purposes. 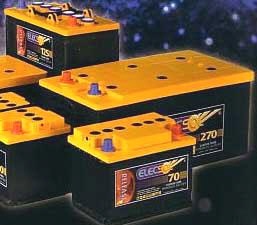 Elecsol batteries can be successfully used as a dual purpose engine start and deep cycle battery. The carbon fibre technology employed in the Elecsol battery range significantly increases the cycling performance and life of the battery when compared to equivalent semi traction batteries. Elecsol batteries will complete over 1000 deep discharge cycles - 3 times as many cycles as the nearest equivalent.